I got home yesterday afternoon to find a very exciting package - my Lomo'Instant Camera! Unfortunately I wasn't prepared with film as I wasn't expecting it for a couple of more weeks so I'll be sharing some photos taken with the Lomo'Instant in the next month or so. If you're not familiar with the Lomo'Instant yet, it was a project that originated on Kickstarter a few months ago (I wrote about it back then). They surpassed their first goal in just hours and ended up raising over $1 million from over 8000 backers of the project. Coloured Gel Filters - The camera was always going to come with 4 standard gel filters but Kickstarter backers were able to vote on which extra 4 filters they wanted and luckily all the ones I voted for were chosen! Judging from the video and test cameras they had, I was expecting something really toy-like and kind of tacky, but I was pleasantly surprised with the quality of the camera. It's quite heavy, it might even be heavier than my Fujifilm Instax Wide camera, but the quality is much better. I have found just from playing with it that some of the buttons and dials don't feel very high quality, but I am very impressed with the body of the camera. I am so jelly! I remember reading the post your wrote when you did the kickstarted! The attachments are really fun! I've been playing and the fisheye is definitely my favourite :P It's cool to have the close-up lens too because you can get a lot closer than you can with any of the Fuji Instax cameras. I know very little about instant photography but this looks awesome! Lots of fun using it! The film for the Instax Mini camera and Lomo'Instant camera is the same. I've taken about 9 photos with the Lomo'Instant and it's really fun but the picture quality of the Mini prints is nowhere near as good as the Instax Wide so if you're going to buy a Fuji Instax camera definitely get the Instax Wide as the quality & size is just so much better. That said, if you do like the mini prints then get the Lomo'Instant as you have so many more options than you do with the Mini 90. Do you prefer the Lomo' to the Instax Wide? 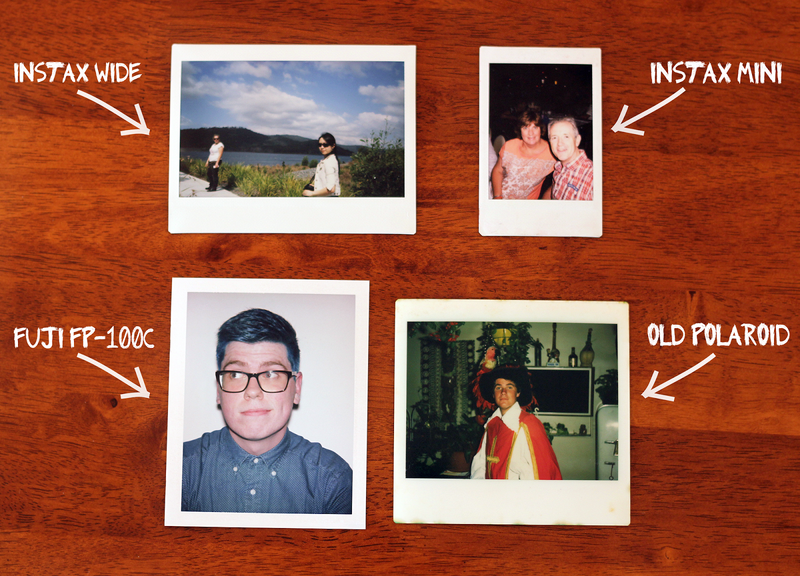 The features are cool but do you miss the size of the Instax prints? Does not being able to turn off the flash of the Instax Wide 210 mess up your photos? Ah amazing, I used to have a fuji instax mini and loved it, apart from the expensive film (its weirdly WAY cheaper here in aus than it was in the UK!). Definitely going to have a little look at buying one of these as her replacement!